According to my brother, these are my new "Where's Waldo" curtains. 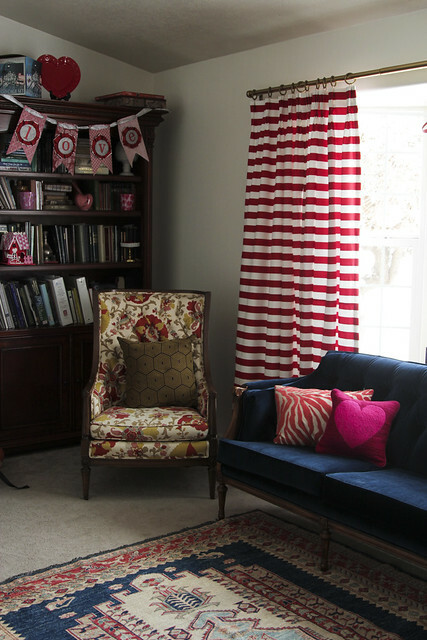 But naysayers aside, our living room has been crying out for curtains for a long time. Most of our living/working/coming and going is visible from this window, and while I'm fine having it open during the day, having the option to close it off at night has been sounding nice for over a year now. I wanted to do something pretty graphic, to keep the room from feeling too stuffy. I tend to lean toward either really fancy traditional or else really glam modern shapes in furniture. And one is much easier to find in online classified ads than the other, so the room was teetering on being a little too granny chic. I was going to sew pinch pleat drapes myself, and was a little nervous about wielding vast quantities of fabric without them winding up crooked, but the fabric I had chosen was pricey enough that I kept holding off on the purchase. Then, thankfully, I stumbled across the etsy shop LaFortune Linens, and ordered these lined with pleats and eliminated all my worries. I had to give up my plans for silk and go with more of a canvas fabric, but I decided that might be a good thing for introducing more whimsy and less fanciness into an already too-formal room. And the finished and shipped curtains cost about as much as I was preparing myself to spend on fabric alone. I lucked out in that the Restoration Hardware curtain rod I had been crushing on went on sale right after I ordered the curtains. It was still a lot to pay for hardware, but it's such a pretty thing, I love it. Mr Renn is hoping they will help keep the room from losing so much heat at night. I love how much contrast they bring to the space. And they are helping me feel motivated to tackle a long list of projects needed to make the whole room come together. If only time and money weren't such hard commodities to come by. I think everyone is having that struggle right along with me. But while I nurse Bunny and wrangle my crazy boys, I will have some awfully happy curtains to cheer me up now! Those are so cute! I love how bold they are! You have such great taste! I love them. I look at your room and think its so lovely. I love how different everything is yet looks so amazing together. I seriously love these curtains. I think they're a great addition to the room and love the style. The horizontal stripe is great and not overtly Where's Waldo, at least in my opinion. I think they're fantastic!